Because it was one of the original intentions of my survey, partly due to the survey’s conception on a nerdfighter forum, this penultimate survey post looks at how education effects how nerdy people are. This could quickly dissolve into a somewhat philosophical conversation about what nerd actually means, but as it’s my sister who’s the philosophy student, I thought I’d leave that for another time – and another person – to discuss. Of the participants, 83% would consider themselves a nerd, and 65% thought that they’d be considered nerdy by other people. 1 Person thought that they’d be considered a nerd despite not thinking of themself as one, but no-one who though of themself as nerd though other people wouldn’t see themself as one. Of those who saw themselves as nerds, approximately 83% expected others to see them as such, implying that nerdyness is an outwardly perceivable trait – with the other 16.7% saying that they were clueless as to how they are seen by others. 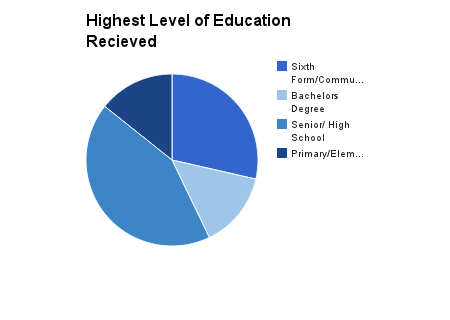 Moving onto the educational stuff, and how it might make someone nerdy, the lovely blue chart above shows the highest level of education received by those would identified as nerds. At first glance, this wouldn’t really seem to show much, as the number who have been to university is equalled by the number who have only completed primary school. However, one important factor is that the ages of those who answered were not asked for, so there could easily be some 11 year old nerds who completed the survey – and expecting them to have been to university would be ridiculous. This would then bring about the question of what sort of age people start to think of themselves as nerdy, but I’d leave that up to a physiologist. 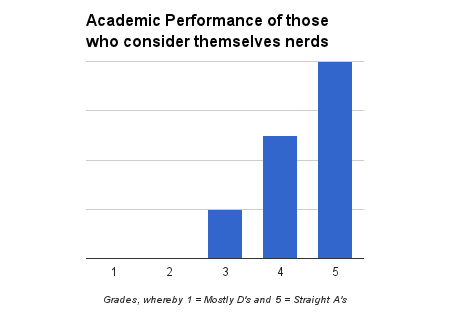 This next graph looks at nerdyness in terms of academic performance, or grades. Here, a scale is used in order to make up for the different grading standards in different countries. as not all countries use letter grades – or use the same letter grades. (I mean, where other than England can you get an M in one of your exams?). All respondents, who considered themselves nerds, achieved average (3) or above average grades. The majority achieved very highly, with mostly A grades. However, there are multiple faults to this system; grade standards vary vastly between countries, (Wikipedia tells me that a British A at A-Level is comparable to a C in Hong Kong A-Levels), and grades rarely reflect and individual’s true potential – but when using them to see if academia affects nerdyness, this is less relevant. The other main stipulation is that of the respondents who didn’t consider themselves nerds, the same pattern occurs – with 4 being the most common outcome for this group. Although I thought it was unlikely that any correlation would exist, this next graph shows if religious schooling affects one’s nerdyness. 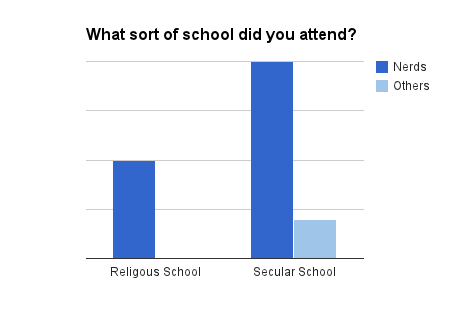 At a first glance, it looks like it does, because all respondents who went to a religious school identified as nerds. However, from having attended more than one religious school, I can tell you that this is not actually the case. The other thing that can be drawn from this graph is that considerably more people go to secular schools, so my primary school experiences of fortnightly mass were definitely more uncommon than I realised at the time. Again the likeliness of a correlation is low, but the next graph looks to see if private education could affect ones nerdyness. And again, I think this graph draws conclusions that don’t actually exist. This graph almost implies that everyone who attends private school is a nerd – and although it wouldn’t surprise me if the proportion was higher. If you want to know why, think Twins at St. Claire’s, and how someone who isn’t very appears (at least to me) less likely to hold a romanticised view of private education, and thus is less likely to have asked for such an upbringing – although of course, wanting to go to private school and actually going to private school are two very different things. → An update I guess?